Now this is a movie! Firstly, who doesn't love Gemma Arterton? 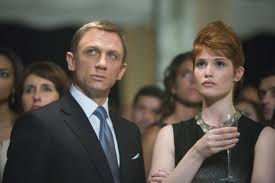 She is cute as a button and enamored the world with her turn as Strawberry Fields in the not-as-good-as-Casino-Royale-James-Bond-film, Quantum of Solace. We were all sad to see her exit from Quantum, but her death was a perfect turn in that flick, just like the perfect turns we have in this one. Arterton plays the titular character, Alice Creed. 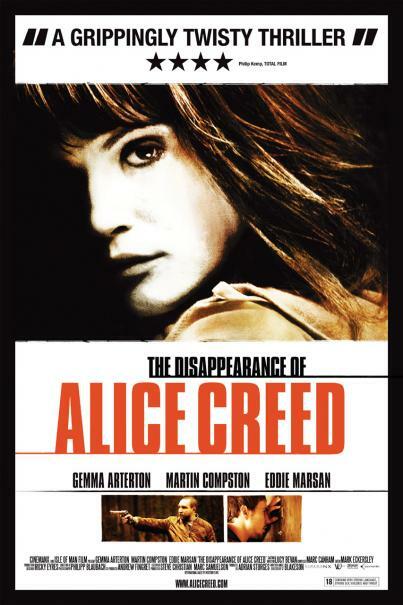 Like the title suggests, the movie centers around her disappearance, or more exactly, her kidnapping. Gemma is not presented as a beauty queen here, but as a regular gal...a real person. The role suites her although according to reports, she had said that the movie taxed her greatly, as she worked to achieve the levels of terror and angst needed for the role (MTV.COM). 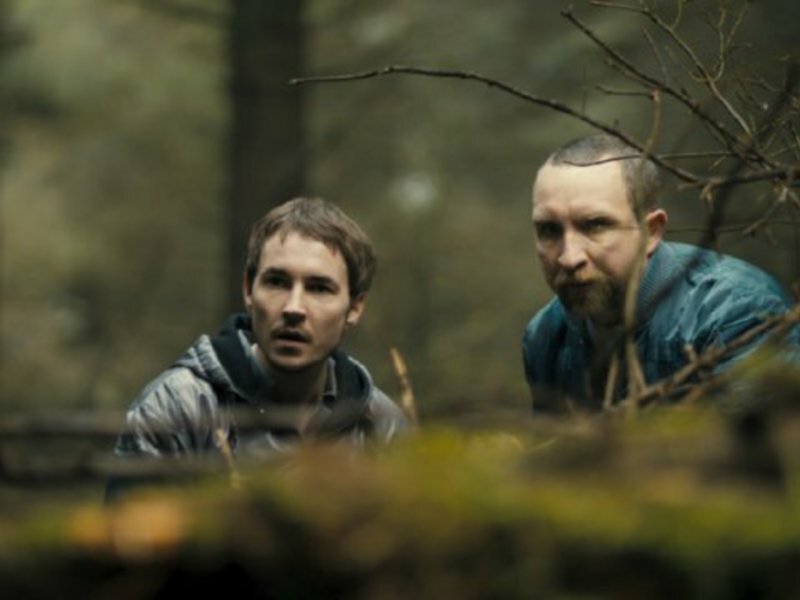 We see the film mostly through the eyes of Danny, played by Martin Compston, whose only American appearance as far as I can tell was in the Neil Marshall UK/US film, DOOMSDAY. If you haven't seen Doomsday, do it. It is one of my favorite post-apocalyptic films of recent times and it also features a fairly prominent appearance by BOB HOSKINS, who Super Mario Brothers aside, is a fine British actor. 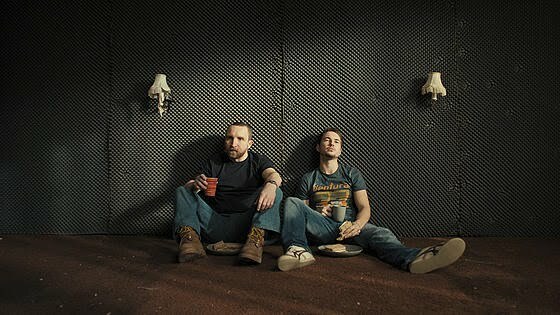 THE DISAPPEARANCE OF ALICE CREED is a British production also, and the partner to Compston's Danny is Vic, played by Eddie Marsan. Marsan is a guy that if you don't know him by name, you sure know him by face. He was the romantic foil, Josef, in The Illusionist and he also played Red, the main baddie in the Will Smith vehicle Hancock. These are just two of the many roles he has taken on and he is good. He is a passionate actor who plays his part as the heavy in Alice Creed to a tee. The opening sequence to this film is a fantastic exercise in filmmaking. Ten minutes passed before the first words of the film were uttered, but the action that plays out sets up the tone without a shadow of a doubt that we are watching a rather dark piece of work. I say dark, but I mean that in the most complimentary manner possible. There is a scene just past the center of this flick that plays for a laugh at first, but quickly brings to bear the severity of the emotions being bore by one of our characters. It is a weighty flick. You might even call it intense. I don't want to reveal too much here, because there are more twists than Lombard street, but just like Lombard, its just crooked enough to be fun. The acting is enjoyable and the plot is nothing new in terms of story (a kidnapping gone wrong) but is excellent in terms of presentation. As the movie unfolds, with each Tarantino-esque turn, you think you can figure out the bevy of potential moves that the movie has to make...but you are probably wrong. I very much enjoyed this and I hope you will too! The REEL RHINO gives THE DISAPPEARANCE OF ALICE CREED a very solid 4 of 5 HORNS. Great movie posters for this also!! Simple, yet tonally accurate! This film to playing in very limited release, but in what I see as a great turn of events for the passionate cinephile, this movie was released On-Demand the same day as its theatrical release. Many say that it will be the end of the era of the cinema, but I disagree. This film is playing only at the LEAWOOD here in the Kansas City metro area. While the Leawood Theater is pretty enough from the outside, the seats are pretty uncomfortable for anyone who goes by the name of RHINO. This pays was not built for Offensive Lineman, that is for sure (no offense to the Fine Arts Group, the Glenwood Arts Theater fits my bum just fine!). I recommend seeing it at the theater, as most movies were meant to be seen. But if you can't because it isn't playing near you, or in case you have a case of the big-bottomed blues, see it On-Demand from the comfort of your living room.